As the dominant tetrapods of the Carboniferous Period, amphibians reigned as top predators in many niches for 70 million years or more. This reign may have been limited, however, by the amphibians' dependency on breeding in the water. This reliance kept most amphibian lineages close to the water and inhibited their expansion beyond the horizon, where drier, more temperate habitats provided additional ecological opportunities. The vertebrates that first broke away from a life bound to the water were the amniotes—animals that produced eggs with a protective outer membrane, a development that made it possible to breed out of the water. Modern amniotes include reptiles, mammals, and birds. The roots of all amniote lineages go back to the Late Carboniferous Period and the evolution of the first reptiles. The origins and diversification of the first amniotes is the subject of Chapter 6. This chapter described the first animals to make the transition from water to land and explored the great diversity of early tetrapods. 1. Two overlapping evolutionary stages in the Devonian history of tetrapod origins included the development of near-tetrapod sarcopterygians and near-terrestrial tetrapods. 2. 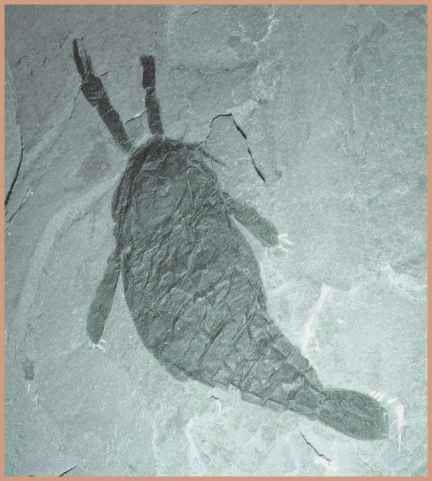 The earliest traces of tetrapods come in the form of partial body fossils and trackways that date from the latter part of the Devonian, about 370 million to 380 million years ago. 3. Of the lobe-finned fishes, the group known as the osteolepi-forms includes the most likely evolutionary precursors of the first limbed vertebrates. 4. Near-terrestrial tetrapods represent an important transitional stage in the evolution of limbed vertebrates but also appear better suited for life in shallow waters. Acanthostega, a water-bound tetrapod, provides fossil evidence that limbs developed for use in the water prior to tetrapods' taking to land. 5. Early tetrapods greatly diversified during the Carboniferous and Permian Periods. They were the top land predators of the Carboniferous, occupying many habitats with a variety of body forms and sizes, including legless and aquatic families that had returned full time to the water. 6. Amphibians were displaced as the top land predators during the Permian Period with the spread of the first amniotes, the reptiles.